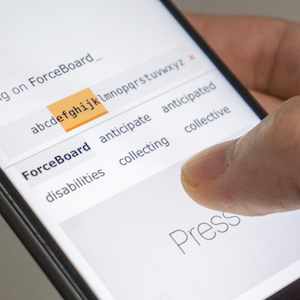 We present ForceBoard, a pressure-based input technique that enables text entry by subtle finger motion. To enter text, users apply pressure to control a multi-letter-wide slidingcursor on a one-dimensional keyboard with alphabetical ordering, and confirm the selection with a quick release. We examined the error model of pressure control for successive and error-tolerant input, which was incorporated into a Bayesian algorithm to infer user input. A user study showed that, after a 10-minute training, the average text entry rate reached 4.2 WPM (Words Per Minute) for character-level input, and 11.0 WPM for word-level input. Users reported that ForceBoard was easy to learn and interesting to use. These results demonstrated the feasibility of applying pressure as the main channel for text entry. We conclude by discussing the limitation, as well as the potential of ForceBoard to support interaction with constraints from form factor, social concern and physical environments.